﻿ Saiensu Fikushon 2016 « Haikasoru: Space Opera. Dark Fantasy. Hard Science. "Overdrive" by Toe EnJoe — How fast is the speed of thought? "Sea Fingers" by TOBI Hirotaka — A small enclave survives after the Deep has consumed the world, but what does the Deep hunger for now? "A Fair War" by Taiyo Fujii — The future of war, the age of drones, but what comes next? 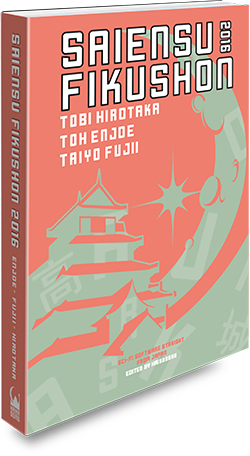 Saiensu Fikushon is Haikasoru's new e-first mini anthology series, dedicated to bringing you the narrative software of tomorrow, today. Now more than ever, the future is Japanese! A killbug was a drone used to indiscriminately kill in the name of ETIS’s fight for an independent nation in the Xinjiang territory. Their small frames were fitted with AK-47 stocks and receivers made in small-scale Tibetan factories, and short, unrifled barrels capable of ring 7.62 mm rounds. Like the PLA’s Bingfeng MUCAVs, the drones were killing machines equipped with internal AI capable of seeking and destroying targets by their own will. The cheap gunpowder available to the killbugs wouldn’t provide enough velocity for the bullets to penetrate reinforced concrete. If my memory was correct, the drone only carried twenty rounds. Even if it decided to expend it all in one blind volley, as long as we kept our heads below the windowsill, we would be all right. Diving for the window had been the right course of action. I signaled with my hands to let Wen, Jinzhu, and Aypasha know that we had a killbug outside. But when I looked across the office, I saw something that left me stunned with disbelief. Across the of office, Bateer stood, his mouth hanging open. He, and the rest of the staff, were staring in bewilderment at us four crouching beneath the windows. I began to shout, “Wodao!— “Get down!”—but realized that they would be unfamiliar with military speak. A few slowly lowered their heads, but Bateer simply looked out the window with a confused expression. No, duck first, I thought to him, then look. As I was about to speak up, a breeze came into the room. I heard two sounds: a door opening, and a voice speaking in thick Japanese. It was Kuma, the head of the company. He picked a hell of a time to show up at work. His stocky frame draped with a relaxed beige suit, the boss grabbed the brim of his white hat and was making a show of doffing it as his gaze landed on my signaling hand. From his breast pocket, Kuma withdrew a pink tube roughly the size of a cigar and pointed it at the window. I didn’t understand what he was doing, but he said it so forcefully that we obeyed without a word, moving away from the window and ducking down even lower. His thick thumb, with hair coming all the way down to the second knuckle, pressed against part of the tube. The sound of the thing, like a peanut shell bursting open, sent my hair standing on end. “Ow, ow, ow!” Kuma said with a grimace as he tossed the pink cylinder to the ground. The tube rolled to a stop near my feet, where it sent out wisps of smoke and the acrid smell of burning plastic. “You’re not supposed to use it without gloves,” Kuma explained, walking to the window next to me. He put his hands on the sill. I picked up the smoldering pink tube. It carried a label marked Ying-xiang (Bug Fumigant) followed by usage instructions that extolled its effectiveness against killbugs. I couldn’t tell if it had broken naturally through use or if it had broken when Kuma dropped it. On one end, a triple-A battery peeked out from the loosened cap. As I was inspecting the device, Kuma spoke. “It’s an EMP. Look for yourself.” He gestured out the window with his chin. I stood and followed his sightline out the window, where the killbug was gradually dropping altitude in search of a place to land. Before I could respond, someone else spoke up from behind me. I turned and saw it was Bateer. His face looked ashen and blood-drained, and his eyes were wide. I don’t know if he just didn’t hear me, but the roids247.xyz next thing he did was duck in a panic. Losing balance, he stumbled over his chair and toppled to the ground on the other side. Likewise, the other staff finally got around to crouching. Kuma let out a good belly laugh.